Present state: Station demolished but site still exists in part as it is in a deep cutting leading into a tunnel. There is no access as site is landlocked between housing development. Notes: Walton-on-the-Hill station was situated on the Cheshire Lines Railway (CLC) North Liverpool Extension Line, Huskisson Branch. The North Liverpool Extension Line branched of the CLC Liverpool and Manchester line at Halewood and ran to Aintree via Gateacre, Knotty Ash and West Derby. The Huskisson Branch had two junctions with the main line, forming a triangle, to the east of Walton-on-the-Hill: these were Fazakerley South Junction (used by Huskisson branch trains running to and from the Halewood direction) and Fazakerley North Junction (used by Huskisson branch trains running to and from the Aintree direction). The branch forked for the two junctions at Fazakerley West Junction. The CLC was a joint railway with three partners, the Great Northern Railway (GNR), the Manchester Sheffield & Lincolnshire Railway (MS&LR) and the Midland Railway (MR). All had wanted access to Liverpool which, by the mid nineteenth century, had become a major seaport. The CLC Liverpool and Manchester line, which opened throughout on 2 September 1873, had given the three companies access to Liverpool, but only to the south docks. To north of the city new docks had been built to accommodate much larger vessels. The London North Western Railway (LNWR) and the Lancashire & Yorkshire Railway (LYR) had access to the north docks, and the CLC partners wanted the same. The most logical way for the CLC to gain such access would have been to extend their Liverpool and Manchester line by three miles from its Liverpool terminus. However this would have involved prohibitively expensive tunnelling under the city centre. The alternative solution was to build a line around the eastern edge of the city using agricultural land that was, by the 1870s, very cheap. The only significant engineering required was at Walton, north of Liverpool. The North Liverpool Extension Line and its branch to Huskisson were authorised on 30 July 1874 and opened from Halewood to Walton-on-the-Hill on 1 December 1879. 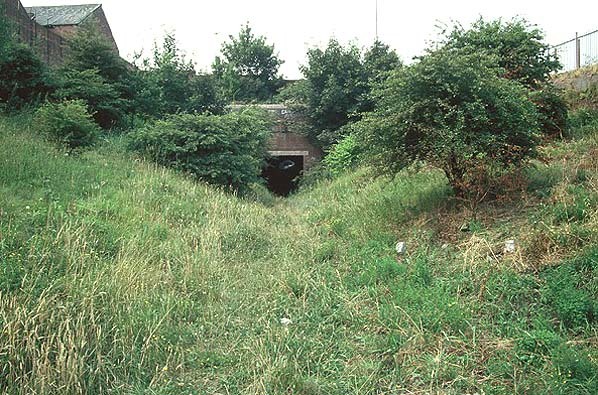 The station was located in a cutting at the north end of the Walton-on-the-Hill tunnels. There were three tunnels: in order from the station they were Walton Hill, Breeze Hill and Hawthorne Road. The station building straddled the line above the Walton Hill tunnel. It was at street level on Rice Lane. 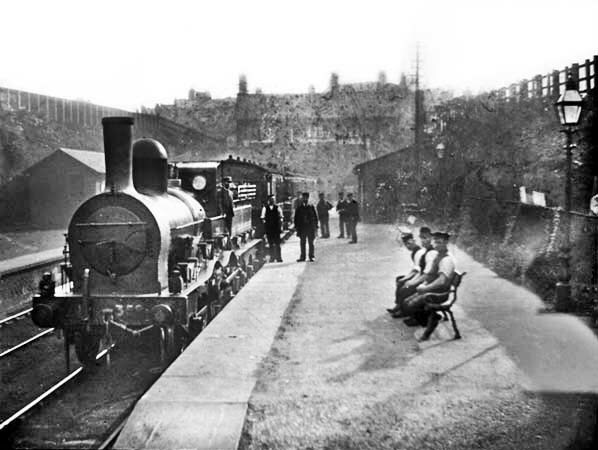 The Huskisson branch was a double-track railway, and paths cut into the sandstone walls of the cutting led down to the two platforms. Both were provided with basic waiting shelters. At the north-east end of the down platform, east of the line, was Walton-on-the-Hill shed. On the west side to the north-east of the up platform was the station goods yard which consisted of five sidings and a10-ton crane. At the north-east end of the up platform was a CLC type St/CL1 signal box. Constructed from timber the box had a 16-lever frame. At the time of opening Walton-on-the-Hill was served by trains to and from Liverpool Central, a circuitous journey of over 13 miles; Walton was only 3½ miles from central Liverpool by road. The second departure for Liverpool Central on 1 December 1879 left Walton-on-the-Hill at 8.00am. The train consisted of eight coaches hauled by MS&LR engine number 266. The train was involved in a crash towards the end of its journey at Brunswick Junction where it ran into MR engine number 1297. One person was killed. 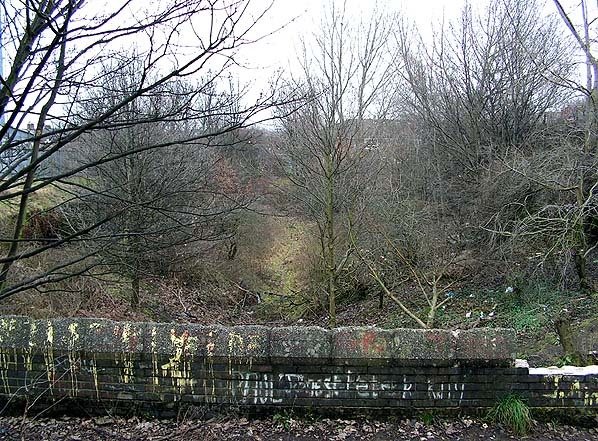 The most significant engineering feature on the CLC north Liverpool lines were three tunnels between Walton-on-the-Hill and Huskisson. They were not ready for use until 1 July 1880 when goods services started to operate to and from Huskisson. On 13 July 1880 special trains were run from Huskisson and Walton-on-the-Hill to Aintree for a race a meeting. On 1 August 1880 Huskisson opened for public passenger services and Walton-on-the-Hill became a through station. On 11 August 1881 a scheme called the Southport & Cheshire Lines Extension Railway (SCLER) was approved. 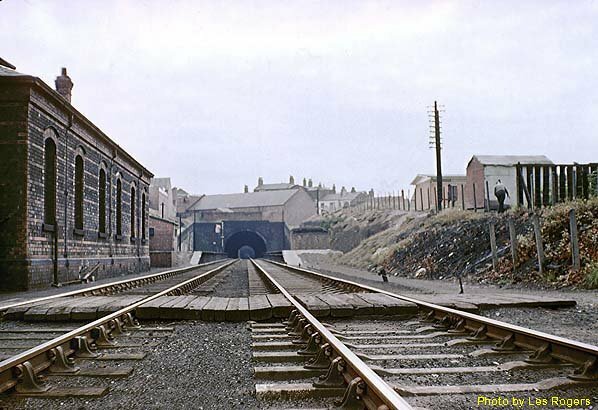 The CLC backed the scheme which created a line from Aintree to the seaside resort of Southport and made an end-on connection at Aintree to the North Liverpool Extension line. A route to the seaside town and its promising lucrative traffic would be created which the CLC had agreed to operate - although the SCLER would be a separate company. The SCLER line opened on 1 September 1884. The racecourse station at Aintree opened for public services at the same time. Walton-on-the-Hill gained services to and from Southport. Huskisson passenger station proved to be hopelessly un-remunerative and it closed on 13 July 1885. Walton-on-the-Hill became the terminus for local services once again. The December 1895 timetable showed Walton-on-the-Hill as having six arrivals and five departures Mondays-to-Fridays as shown in the table below. There were five arrivals and four departures on Saturdays and three trains in each direction on Sundays. The passenger service was very much orientated towards workmen. Most passenger trains running along the North Liverpool Extension Line simply bypassed Walton-on-the-Hill. In 1915 Walton-on-the-Hill lost its passenger service. The station was closed officially to passengers on 1 January 1918. The platforms at the station had made for a very convenient place for locomotive crews to join or alight from trains. Crews from many of the long-distance goods trains were relieved at Walton-on-the-Hill station, and the trains were taken forward to Huskisson by local men. The same occurred with regard to trains outbound from Huskisson. For this reason the station was kept in good order after the withdrawal of the passenger service. It was also used from time to time for excursions. To the north-east of the station the area within the triangle formed by the junctions (known locally as the Walton Triangle) was filled with sidings over the years and became an important stabling and marshalling point. At the grouping of 1923 the CLC remained independent but its parent companies changed. The GCR and the GNR became part of the London & North Eastern Railway (LNER) and the MR became part of the London Midland & Scottish Railway (LMS). The LNER was given two-thirds of the CLC shares and the LMS one-third. Motive power for CLC services was provided by the LNER. On 12 July 1933 the Walton-on-the-Hill signal box closed and Fazakerley West box took over control of the line through the station. At nationalisation in 1948 the Huskisson branch became part of British Railways London Midland Region. The Walton-on-the-Hill locomotive depot closed on 15 December 1963. Walton-on-the-Hill station saw a visit by a passenger train on 13 June 1964. The ‘Liverpool Suburban Rail Tour’ called at Walton-on-the-Hill for a photo stop on its way back from Huskisson. On 26 June 1966 the line from Fazakerley West Junction to Huskisson was singled. The former up line through Walton-on-the-Hill was lifted. 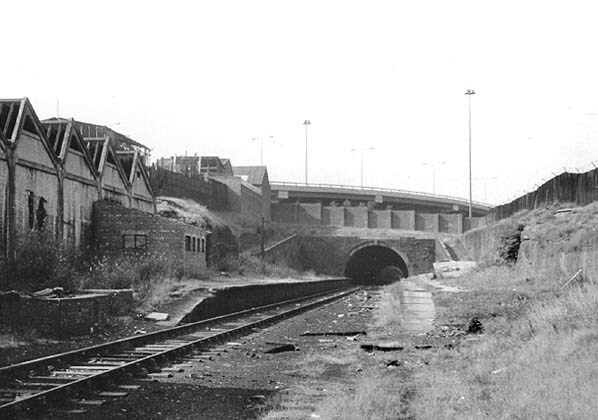 The sidings within the Walton Triangle closed on 9 September 1968. By the early 1970s the station saw only a single weekday train pass through on its way to and from Huskisson. The train was a trip working from Edge Hill to Huskisson and return. The last of these trains ran in July 1975 although daily services had ended by May of that year. Track was lifted through the station site in 1978. The platforms survived until the early 1980s when the Walton triangle and the locomotive shed site was developed with housing. Although the station site itself was not built on it was partly in-filled, which buried the platforms. In October 2012 the ramps that led to the platforms could still be seen. Timetable from Chris Hind and route map by Alan Young. Walton-on-the-Hill station looking south-west along the up platform around 1897. Standing at the platform is an all stations service to Liverpool Central. At the head of the train is a Charles Reboul Sacré design 4-4-0 inside cylinder double framed Manchester Sheffield & Lincolnshire Railway (MS&LR) locomotive number 359. CharlesSacré was the chief engineer of the MS&LR from 1858 to 1886. The locomotive is in MS&LR livery but without the company lettering which suggests the period shortly after it had become known as the Great Central Railway. Station and other railway staff are seen posing for the camera. The rolled up shirt sleeves suggest a warm summer day. Walton-on-the-Hill station and the adjacent engine shed shown on a 25-inch scale map from 1890. the station goods yard is also shown. The complex railway system around Walton-on-the-Hill shown on a Railway Clearing House map from 1915. The CLC system is shown coloured orange. Walton-on-the-Hill station shown on a 25-inch scale map from 1927. Although closed to passenger services the station had gained a goods shed by this time. 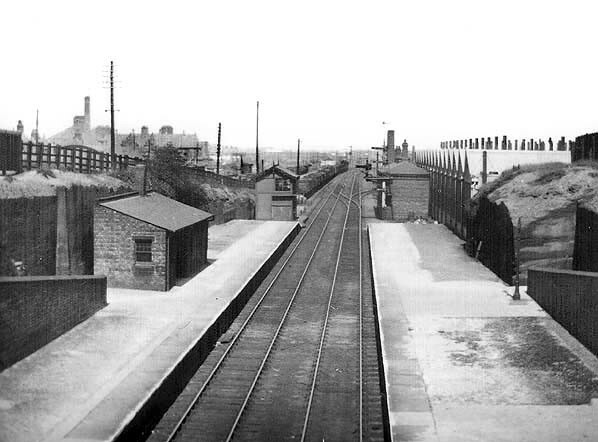 Looking north-east at Walton-on-the-Hill station in 1930. The station had been closed for twelve years but remained unaltered and kept in good order. Beyond the station, to the right, can be seen Walton-on-the-Hill locomotive shed. To the left is the station signal box that lasted until July 1933. The Liverpool Suburban Rail Tour at Walton-on-the-Hill on 13 June 1964. Looking south-west towards Walton-on-the-Hill station in July 1961. To the left is the locomotive shed and beyond it the station. The three tunnels that carried the line down to Huskisson can be seen at the far end of the station. A view of Walton-on-the-Hill station looking south-west on 17 August 1971. The site of Walton-on-the-Hill station looking south-west in August 1995. Very little was left to show there had been a station at this location. Looking north-east at the site of Walton-on-the-Hill station on 7 February 2010 from on top of Walton Hill tunnel. The path in the foreground linked the platforms via ramps on each side of the tunnel portal.